Memorial Day has come and gone and while it’s not technically Summer yet, it’s officially white jeans season! 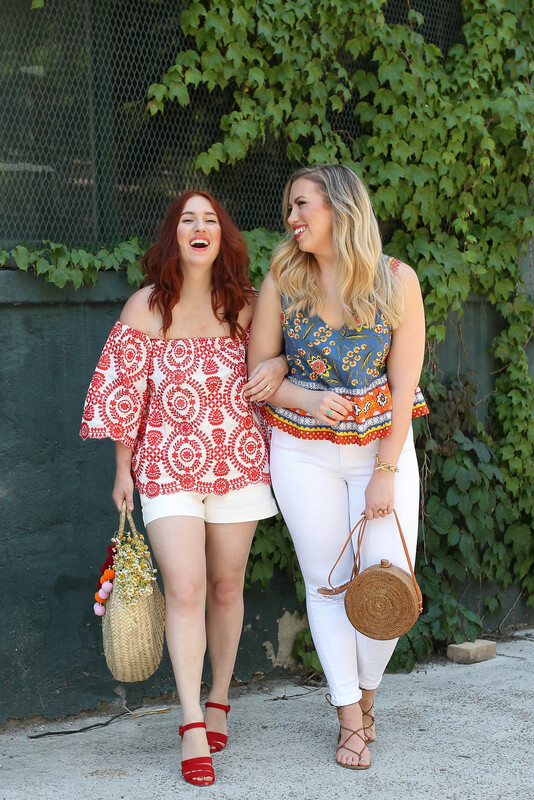 Actually for Megan and I it’s white jeans season all year long, but some people still reserve white jeans for the days between Memorial Day and Labor Day, so we’re here to show you 2 ways to wear them! I’m more of a white jeans type of girl, but they have to be the right white jeans! The right thickness, opaque enough, high waisted and comfortable! I’ve tried on dozens over the years, but this Topshop pair is definitely my favorite! Dare I say they’re even slimming! I’m always leery when it comes to photographing white jeans, because they’re not always the most flattering on camera, but I was pleasantly surprised that these looked just as great in photos as I felt wearing them. Megan is all about the white shorts! This Everlane pair is relaxed, comfy and the perfect length! They can be dressed up or dressed down and a summer essential for both Megan and me! I’ve rounded up the best white jeans under $100, because if you’re really only going to wear them for 3 months out of the year, you better get them for a great price!